Edmonton Skydive operates out of the Westlock Municipal Airport. We are a dynamic, fun jumper dropzone with highly skilled canopy pilots and freeflyers. We have a world-class organizer or coach at least once/month and a local rockstar LO filling in on the remaining weekends. We welcome student and experienced jumpers of all disciplines, from all over the world to come hang out and have a good time at Edmonton Skydive. Check out our Events Calendar for all the latest at Edmonton Skydive! Please note that we have separated landing areas. Please note that this is a high experience, tandem and high speed landing area. Jumpers must have a minimum of 500 skydives to land in Area 1 and always give right of way to tandems. This area is dedicated for student, novice, junior and intermediate (less than 500 jumps) jumpers. This is the clearest area and is the intended landing area for all jumpers fitting into this category. Please try to avoid flying your pattern into Area 1. 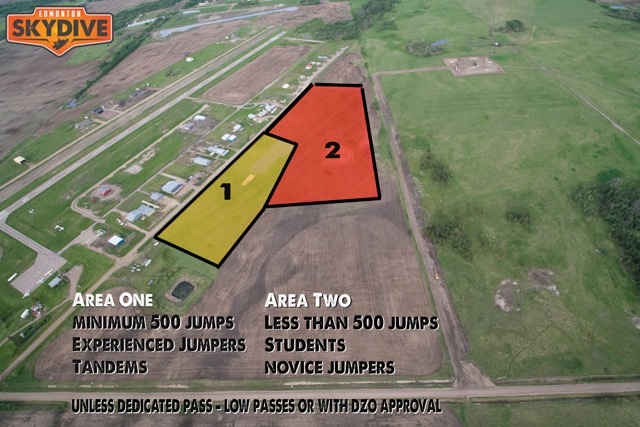 * All new jumpers to Edmonton Skydive must receive a proper, on-site, DZ briefing by an authorized Edmonton Skydive staff before manifesting for a jump. Absolutely NO PETS are permitted onsite. We operate on a municipal airport. Pets are prohibited. Please do not take your pets to the DZ.